Vance & Hines Fuelpak FP3 revolutionizes fuel management for modern motorcycles. 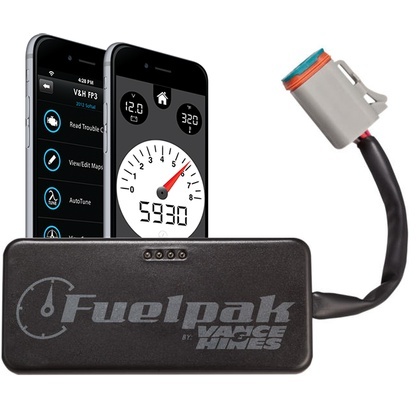 Now, you can wirelessly connect to your aftermarket fuel controller from Vance & Hines via Bluetooth on any iPhone or Android Smartphone to make changes to the way your bike performs. V&H Fuelpak FP3 uses Flash technology to recalibrate various engine cycles and mapping for exhaust systems and other performance upgrades downloaded from Vance & Hines extensive tuning library. Fitted standard to the Fuelpak FP3 is an Autotune feature. The device takes into account all factory-installed sensors to add another layer of precision tuning for your machine's specific requirements to make the most out of aftermarket performance components or different grades of fuel. A live sensor data feed can be viewed through the smartphone to display speed, RPM, cylinder head temperature, voltage, gear selection and other vital information. You'll be able to see what your bike is thinking! Ordered this V&H FP3 on a Sunday night, arrived Wednesday. I'm impressed! First time I've done business with Parts Giant it sure won't be the last. As far as the FP3 - works as advertised. The stock "map" I flashed worked better than what I had. Got rid of the "decel pop". Still working on the "Autotune", but I'll see if it fine tunes it even more. It took 10 minutes to install. I noticed a difference on the first ride. I have a Fat Bob with short shots and the back firing was instantly gone. The bike screams down the highway. 2013 Harley-Davidson FXSB Breakout 103 cubic inches. I like this thing! I had been having issues with my bike "hiccuping" back through the throttle body. It did this a lot, and she ran even worse when it was hot. So I order the FP3 with auto tune. Got a screaming eagle open oval intake and Bassani 2 into 1 exhaust installed. Downloaded the map for this setup, I used the generic 2-1 exhaust, Bassani wasn't listed, flashed it and riding in 10 minutes or less. Instantly better. No more hesitation or hiccups! I love my bike even more than before, running like a champ. So, then I do the autotune feature, because you know, better isn't good enough! She runs like a scalded dog now. I was hesitant to buy at first, sure am glad I bought the FP3. I like the live sensor display too. Can see everything right on your phone. So easy to use even a caveman can do it! Love it, nice and easy, like it better than Dynojet. Installed it on my 2014 Iron 883. Vance and Hines staggered short shots with the V02 air intake. Smoothed out completely. Start up idle is lower. Take off power is fun. Passing power is a relief. Shifts smoother. All around it just performs. Super easy install. Performs as advertise. Im so happy with this tuner! Works exactly like they said it would. Makes my bike run sooo much better! I bought this along with a Cobra Power Flow intake V&H Shots and my Sportster Custom transformed in a monster. FP3 map was great out of the gate but ultimately went for the autotune over the course 5 days and tried a few maps. The second map led to some odd performance until the engine got up to high operating temps. The last map turned out to be outstanding. I don't have any objective dyno runs to prove it but the seat dyno tells me it's greatly improved from the stock intake/pipes/factory tune setup. Yes, the Fuelpak FP3 will indeed work on a 2016 Harley FXDLS Dyna Low Rider S. Simply choose your bike from the dropdown menu that's to the right of the main image and we'll be sure to get the correct Fuelpak to fit your bike on its way to you! Yes, it will indeed fit the 2016 model year Harley Davidson Heritage Softail Classic. Simply choose your make, year and model from the drop down menu that's to the right of the main image and we'll get to the Fuelpak FP3 to fit your FLSTC on its way to you fast. Will this work on 2015 street glide, with slip-on's. Yes, the Fuelpak FP3 will work with the 2015 Street Glide and it's more than capable of working with your bike's slip-on exhaust system. You can simply plug it in following the included installation instructions and, using your smartphone and the FP3 app, set it to the automatic tuning function wherein it'll automatically adjust fueling to suit your bike while you ride. And of course, if you feel like you can do even better with it, or there's a particular area where it's not performing how you'd like, that same app will allow you to customize fuel delivery for the absolute best throttle response and engine performance possible. Everything you need to fit this to your bike is included in the kit along with a set of easy-to-understand instructions and a user guide to help you get the most out of your bike. Will it work with a 2015 CVO Streetglide with the 110 cui motor? I have the heavy breather and the new Vance and Hines 450 and I'm going to remove the catalytic from the head pipe. Is there an option to tell the fuel pack that I did that? Yes, this unit will indeed fit your 2015 FLHXSE Street Glide. All you have to do is select the 2015 FLHX from our drop down fit guide and we'll get the proper unit on its way to you since both machines share the same wire harness. Once installed, the FP3 will recognize your bike's fueling requirements and you'll be able to easily calibrate the device accordingly. It will handle the breather and the exhaust you have without issue using the automatic tuning function that's built-in to the system. All of this is explained in the easy-to-understand user manual that's included with the FP3. Plus, if you download the smartphone app, you'll be able to fine tune the bike's fueling needs for the best possible engine output and throttle response. Is there an option for tuning after removing baffles from vance and hines pipes? Yes, absolutely! And it's a rather simple affair to get the V&H FP3 to work with just about any exhaust setup, with or without the baffles. The first thing you'll want to do is have a look at the Vance & Hines fuel map library using the Map Lookup function on the FP3 Fuelpak App. There, you'll be able to configure the FP3 to your exact needs. Once you've done that, simply use the Autotune function to fine-tune your bike's fuel delivery. In this way, you'll notice the maximum benefits possible with the FP3 installed on your bike. does the fule pack 3 have to stay connected at all times? No, it does not have to remain connected to the bike at all times since the unit actually flash tunes the ECU every time you make a change. You should know, however, that the FP3 can only be used on one motorcycle ever, since each ECU is coded with the bike's VIN. That is to say, it will be married to your bike and cannot be used on multiple machines. If you are planning on using one FP3 to tune many bikes, it will not be possible. You must purchase one unit for each bike that you have. Does this fit 2016 sportster 48 1200cc? 6 pin? Yes, that's correct! The Vance & Hines FP3 Fuel pak will fit the 2016 Harley Sportster 48 by plugging into the 6-pin wire harness. Simply choose your bike from our drop down fit guide that's immediately to the right of the main image above, and we'll get the correct FP3 to fit your Sportster Forty-Eight on its way to you, fast! Will this fit my 2016 HD Softail Breakout? Yes, absolutely! We have an FP3 Fuelpak to fit the Harley Softail Slim. Simply choose your bike from the fit guide that's immediately to the right of the main image above and we'll get a Fuelpak to fit the FLS on its way to you, fast! I have a 2016 Tri Glide. Will it work on that? Yes, the V&H FP3 will fit the 2016 Harley FLHTCUTG Tri Glide Ultra Classic. Simply choose that bike from our drop down fit guide that's immediately to the right of the main image and we'll get the V&H FP3 for your trike on its way to you fast! will this work on a 2016 street glide special ? i also have cobra slip on exhaust will any tuner work with these slip ons ?? Yes, the FP3 would be an excellent match for your 2016 Street Glide Special's configuration. It'll plug right into the OEM wire harness, at which point, you can use the iOS or Android-based mobile app to configure the device for your specific needs. Once you've done that, you're all set. Then, if you really want to get the most out of the device, you can use the included autotune feature that'll help you get the best possible throttle response and engine performance for your riding needs. All of this is clearly explained within the included user guide and installation instructions that come with the device. For your needs, the FP3 would do everything you need to get down the road with the best performance possible. Furthermore, if you were to change the Street Glide Special exhaust or add an FLHXS aftermarket air cleaner to your bike, the FP can be adjusted for those changes just as simply as it was when you first installed the unit using a smart phone. Most dealers will honor the factory warranty after the installation of the Vance & Hines FP3, in the case that they do not, you may have a remedy under the rules set out by the Magnuson-Moss Warranty Act. In 1974, the Magnuson-Moss Warranty Act was signed into US federal law. One of the key provisions of this act is that it prevents a warranty provider (the manufacturer) from denying claims on the basis of a non-related part being modified or installed on your machine. In other words, so long as the part that you put on your bike did not directly cause a malfunction that's covered under warranty, the manufacturer should not be able to deny the warranty claim due to the installation of a non-standard part. Can I read program it to another bike? No, you can only use the Fuelpak FP3 to tune one motorcycle. Once you plug the unit in and initialize it to your bike, it's married to the VIN number that it reads off of the bike's ECU. After that, it is not possible to use it on any other motorcycle. Still, you can use the FP3 to read error codes or live display data on other bikes since those functions don't require the device be registered to a specific ECU. It's only the FP3 tuning function that's restricted to use on one bike. The FP3 from Vance & Hines can be configured to work with just about any intake and exhaust combination, including a Rhinehart exhaust matched to an Screamin' Eagle intake. Once properly configured using the Vance & Hines FP3 Andoid/iOS app, you can certainly expect better throttle response and improved power output. This holds especially true if you were to use the included FP3 Autotune feature. Just plug the 2016 Road Glide FP3 into your bike, set it up via your smartphone and you'll be all set! I have a 2016 Ultra Limited CVO and I do not see it listed. The standard 2016 FLHTK and the FLHTKSE CVO share the same Fuelpak FP3. Simply choose the 2016 FLHTKSE	from our fit guide and we'll get the correct Harley Ultra CVO FP3 on its way to you! Yes, the Vance & Hines FP3 for the 2013 FXDC Dyna Glide Custom Harley will also fit the Super Glide Anniversary Edition. Simply choose the 2013 FXDC Dyna Glide Custom from our fit guide and we'll get the proper FP3 on its way to you, fast! will the fp3 work better than a screaming egle sreet tuner? i have v&h short shots and stage one air cleaner kit. Both, the FP3 and the Screamin' Eagle tuners work by flashing a map to your bike. In the case of the Screamin' Eagle unit, you need to have a working knowledge of engine tuning in order to configure it to work best with your bike. The FP3, on the other hand, is a simple-to-use device that allows you to make guided tuning decisions with minimal chance of over-doing it and causing any further issues. This holds especially true for the auto tune feature. In other words, you don't need to pay a technician to set up the FP3 for you, so long as you have an iOS or Android smartphone wherein you can use the free FP3 tuning app. With a smartphone, you have everything you need to get the job done at home. The Screamin' Eagle system, on the other hand, requires that you fully-understand fuel and ignition maps in order to get the most possible benefit out of the device. Unless you've got a massive build (cams, bigger pistons &etc.) - you're probably better off with the FP3. Given your bike's current configuration, the FP3 would probably be your best bet, both in terms of time/money and also, in ease of setting it up for your specific configuration. 201o Ultra Glide completely stock. Would autotune improve the stock mapping on the bike. Is that something that can be done?? Yes, the Autotune function can indeed be used to improve the stock Ultra Glide mapping. In fact, it's especially useful at partial throttle settings when cruising around town or on the highway. So long as you have an Android or iOS smartphone, you'll be able to get everything configured to your machine's exact needs without issue. Will this work with my 2016 Fatboy Lo stock exhaust? Absolutely yes! The FP3 for the 2016 Fat Boy Lo will indeed serve as an excellent upgrade for the stock FLSTFB. When properly configured, you will notice improved throttle response throughout the entire performance envelope. No, you needn't leave the phone connected for the autotune feature to work. You only use your phone to initiate the process and then flash the finalized map to your bike. That is to say, once you plug the device in and set it to the autotune function, you can disconnect your smartphone and go for a test ride. It's recommended that you go for at least 20 minutes of ride, but we strongly encourage you to ride through a full tank. Once you've done that, open the app, select the "finish autotune" feature and the new settings will be flashed to your FP3. Can you swap back to the stock tune an un merry this from the bike for warranty work? You can certainly use the FP3 to flash your bike's ECU back to the OEM configuration. You can do it this way since the OEM ECU isn't married to the FP3 so much as the FP3 is married to the OEM ECU. All of this flashing can be done quickly and easily using the iOS or Android Vance & Hines FP3 app. Yes, there is a Vance & Hines FP3 for the 2016 Harley Sportster Roadster 1200CX. Simply choose your bike from our fit guide and you'll get the correct Sportster Roadster FP3 on the way to you, fast! Will this work on a 2016 FXDWG? Yes, the FP3 will indeed fit the 2016 Dyna Wide Glide and you can certainly remove the O2 sensors and still run the unit. Just choose your bike from our fit guide and we'll get the correct FP3 for the FXDWG on its way to you in short order. WHEN SET UP TO AUTOTUNE ON MY BRAND NEW 2016 HD FLHXS HOW MUCH MORE PREFORMANCE IS EXPECTED AND IS IT A GOOD THING FOR A NEW BIKE ? WHAT KIND OF VALUE CAN I GET FOR THE BUCK ? At the very least, you can expect improved throttle response upon installing and correctly adjusting the FP3 for your bike's exact configuration. In stock form, there's probably not too much to be had in terms of power output. Of course, if you were to add an aftermarket exhaust system and an intake kit - you'd certainly be privy to more power output and even better throttle response provided the FP3 is set up for your machine's specific configuration. Furthermore, if you were to implement the device's Autotune function and follow those recommendations, you'd be getting the absolute best possible performance out of the bike short of taking it to a competent engine tuner for a dyno session. Vance & Hines FP3 fuel tuners do not eliminate the top speed limiter. I have the rc components slip on exhaust on my 2014 street glide special , but I did not see them listed in the exhaust section , which one would I chose during set up . The best thing to do would be to find an exhaust in the FP3 app that's as close as possible to the RC Components slip-on kit you currently have on your bike. If they're of the 4" diameter, you'd want to choose the Blackout Slip-On Exhaust. For 3" diameter RC Components mufflers, go for the Vance & Hines Fishtail Slip-ons &etc. In doing so, you'll get the Street Glide Special FP3 well within the ballpark for your bike's required fueling needs. At the very least, you'll want to run about a tank of fuel through the FLHXS once you've flashed the new configuration over to the ECU to see how it runs. The fuel trims will be well within limits for the bike. Still, if after all of that you don't find the bike performing as you'd like, use the FP3 auto tune function to dial everything in just right for your needs. I have a 2015 Ulta limited is this the tuner for it? Yes, we do have a FP3 Fuelpak designed to fit the FLHTK Electra Glide Ultra Limited. With it, you'll be able to configure your bike's ECU to handle a myriad of Ultra Limited exhaust and FLHTK aftermarket air cleaner modifications with ease! Chances are, the FP3 probably has been used with Blow Performance Exhaust components, albeit - there's no ready-made map for those exhausts. Your best bet to use the FP3 on your machine would be to configure the device for an exhaust that's closest in design to the one you have, to what you find the FP3 app. From there, simply use the FP3 Autotune feature and go for a ride. A tank of fuel is usually all it takes to obtain the data needed. From the FP3 app, have a look at the recommended changes and then flash them over to the ECU. From there, you should be all set. Without knowing your machine's exact configuration, it's impossible to say what changes you'll be able to notice once the FP3 is properly configured. The difference in performance you're most likely to notice is in terms of throttle response. Even a completely stock bike could use a more telepathic throttle - the FP3 does an excellent job in this area. As far as noticeable performance changes, that's certainly possible when going from a completely stock bike to one that's got a complete aftermarket Electra Glide exhaust system and an air cleaner kit. With that on the bike, and a properly tuned FP3 - yes, you're probably going to notice a difference. 20015 xg 500 has k&n and tab muffler will this runner work for that setup? Yes, absolutely. Using the free XG500 FP3 app for your Android or iOS phone, you'll be able to configure the unit to deliver the best possible throttle response and engine power output for your bike. Installing the FP3 and configuring everything will take you fifteen minutes, tops. After that, should you decide to make any changes to the Harley XG500 Street exhaust or intake, just use the app to reconfigure everything and you'll be all set. Yes, absolutely. This is due to the fact that the Milwaukee Eight Harley-Davidson motorcycles employ the same CAN-BUS electrical system as the previous generation bikes. Even the connectors for the FP3 interface are the same. Simply choose your bike from our fit guide and we'll get the Milwaukee 8 FP3 you need on its way. Just plug it in, use the free Android or iOS FP3 app to configure your bike and you'll be all set. Vance & Hines doesn't produce an FP3 to fit the 1998 Harley-Davidson Road King. For that bike, we recommend the Cobra Fi2000R Road King Fuel Controller. With that device, you'll be able to set it up and configure it to work with your machine in about twenty minutes. The included instructions do an excellent job of explaining how to set it up and tune for your machine's particular configuration. Plus. there's no need to download a smartphone app to get it set up, just install it, adjust one of the three tuning dials as recommended and you'll be on your way. I have a 2014 street glide special with stock pipes I removed the head pipe in the mufflers and pretty much converted it into 2 in 1. I have Arlen invented airbox. Will the FP3 work with my set up? The Street Glide FP3 will certainly get you closer than the stock ECU could ever hope to, and with good result too. When you install the unit, open the free FLHX Vance & Hines FP3 iOS or Android app, and then set the configuration tool to the closest configuration possible to what you have on the bike and flash it to the ECU. Once you've done that, set up the auto tune feature and go for a ride. Usually, a tank full of fuel is all it takes to acquire enough data. After the test ride, open the FP3 app, check out the recommended changes and flash those to the Street Glide Harley ECU. Once you've done that, you'll find that the bike responds even better to throttle inputs and delivers excellent power output. I have a 2012 Fat Bob with the Screamin Eagle download on it. I took the battery out this Winter and the ECU seems to have gone back to the factory setting. Seems so lean it won't idle now. I can get it running but it won't idle. Do I need to do anything other than hook this up to get it to run? The guys at the Harley shop said I had to have the stock map reinstalled to use one of these. For your particular needs, you'd only have to install the FP3 and then flash over the updated mapping via the free iOS or Android FP3 app. Once you've done that, you should notice an improvement in the way that bike is running. After that, you may wish to use the Auto time feature and burn at least a tankful of fuel to collect tuning data. Once you've done that, open the FP3 app and flash over the recommended changes. After that, you should find the bike runs very well. can you alter engine timing or adjust ignition with a cam up grade? The FP3 has no provision for adjusting ignition timing, it only adjusts fuel delivery. Still, many riders have found it more than suitable for mild aftermarket cams in addition to things like a full exhaust system and air intake. If you're really going all-out, take a look at the Harley Davidson Power Commander V with Ignition Control. That device will give you everything you need to get the most out of your new cams. And if you're delving into the engine that much, you might as well have it properly tuned on a dyno in order to get the most power output available from your setup. Once installed and properly configured, you can expect (at the least) improved throttle response and better engine power output. Combine that with an exhaust system and/or an air intake kit, you can expect even bigger gains that by just installing the FLHXS 2017 FP3 itself. The FP3 will plug right into the OEM wire harness without issue and, once you've configured it for your bike's specific needs, just flash it over to the ECU using the free iOS or Android FP3 app and hit the road. It's really quite a simple device to install and configure. And to get the absolute biggest benefit from the device, use the Autotune function, ride through at least a tank of fuel, flash over the recommended configuration and you'll be all set! Yes, the 2016 Breakout Harley FP3 Fuelpak will work excellent with a FXSB Bassani exhaust and the stock air cleaner. Just plug it in, follow the guidelines that are clearly laid out in the FP3 iPhone or Android app, flash it over to the Breakout Harley ECU and you're all set! And if you really want to go all-out, use the autotune function, burn a tank of gas through the bike riding your preferred route(s), and then flash over the recommended changes shown in the FP3 app. In this way, you can be sure to get the best possible power output and throttle response. Will the Vance & Hines Fuelpak FP3 Autotuner work on a 2012 Heritage Softail with Freedom Performance true dual exhaust? The bike also has a Screamin' Eagle air filter. Yes, absolutely! And it's a rather simple affair to get the V&H FP3 to work with just about any exhaust setup, with or without the baffles and/or air cleaner. The first thing you'll want to do is have a look at the Vance & Hines fuel map library within the FP3 Android/iOS app via the Map Lookup function. There, you'll be able to configure the FP3 very closely to your exact needs. Once you've done that, simply use the Autotune function to fine-tune your bike's fuel delivery. Just run a tank of gas through the bike, make the suggested changed and you'll be all set. In this way, you'll notice the maximum benefits possible with the FP3 installed on your bike. If i loose 12 volt power does the Fuel Pac Have to be reprogramed?? The FP3 works by flashing maps over to the OEM ECU based upon the information you provide through the FP3 iOS/Android app. For this reason, you don't need to re-program the ECU if the bike were to lose power for any reason. Once the ECU has been flashed, the map is permanent unless you overwrite it with a new map. Will it work on a 2016 Softail Fat Boy S? Yes, we have a FLSTFBS Softail Fat Boy S Vance & Hines FP3 Fuelpack that'll fit the 2017 FLSTFBS Softail Fat Boy S. Just choose your bike from our fit guide and you'll get exactly what you need! I have a 2017 Heritage Softail with Vance and Hines Twin Slash slip ons. What will I gain by using FP 3? The most noticeable difference upon the installation of a properly configured FP3 is the improvement in throttle response. And that really holds true for any well-made tuning system out there. Some riders expect big horsepower gains, which in reality - doesn't happen unless you're installing a full exhaust system and, for really (really) big gains, you need to get into the motor itself. Still, since you don't often get to use all of that power - the gains that can be had in throttle response alone almost always make the device worth every penny. It'll help you get the feeling of your hand being connected directly to the rear tire - something that any serious rider learns to appreciate quickly! With the FP3, you can set the idle speed based on engine temperature. For example, you can run a higher RPM during warm-up and then set it to come down a bit once the bike is up to temperature. All of this can be done through the free-to-download Android or iOS app. I have the FP3 tuner installed on my Dyna can I take it off and use it on another bike? Unfortunately no, you can't use it on another bike. The FP3 can only be used on one motorcycle ever, since each ECU is coded with the bike's VIN and that VIN is recognized by the FP3 as its only partner. That is to say, it will be married to your bike and cannot be used on multiple machines. If you are planning on using one FP3 to tune many bikes, it will not be possible. You must purchase one unit for each bike that you have. I'm looking at the Fuelpak FP3 to support an upgraded dd exhaust with heavy breather for my 2015 Street Glide Special. Do you have a map for this, or is that something that would be preloaded as an option when you tune on the FP3 pack? Typically, the FP3 has maps on it only for Vance & Hines exhaust components since that's all the manufacturer tests them against. No less, you will easily be able to use the tuner with your particular needs via the built-in autotune function. Once you receive the device, just configure it as closely as possible to your current setup, flash that map over, then start the autotune feature. Once you've done that, run roughly a tank of fuel through the bike along your preferred routes. Then, all you need to do us open the FP3 app, upload the recommended changes and you'll be all set. It's a really simple device to use for just about any exhaust or intake modification on the market. Does this only work with Vance and Hines exhaust or all types of exhaust? The FP3 can be configured to work with just about any exhaust system on the market, it doesn't have to be a Vance & Hines pipe. The best way to configure the device is to use the iOS or Android app to set the device to its automatic tuning function. After that, you'll need to burn roughly a tank of fuel through the engine while riding your most familiar routes. After that, use the smartphone app to flash the recommended settings over to the ECU and you're all set. You can use this same feature any time you change baffles, or for example, add an aftermarket air intake. About the only time you come up against limitations for the device is when you start building up the motor with cams, a big bore kit &etc. So long as you're not doing a big engine build, it's more than capable of handling just about any aftermarket exhaust and air filter combination available today. You'll want to start off by selecting a set of slip-ons that are of the 4" variety in the map selection tool of your Android or iOS phone. The Vance & Hines Blackout exhaust would be a good starting point for the exhaust and a VO2 intake would be a good choice on the intake side. Once you've sent that map to the ECU, switch over to the FP3 auto tune function and burn at least a tank of fuel through the engine riding in all the places you'd expect to go. After that, open the FP3 app on your smartphone and upload the recommended settings to your bike's ECU and you'll be all set. It's a rather straight forward process to get the precise fueling your bike needs. Yes, absolutely - each FP3 comes with a set of simple-to-follow instructions. From fitting it to your bike to configuring it with your smartphone, all of the information you need is in the box. You'll want to start off by selecting a full exhaust system of some sort from the app. The High-Output dual exhaust system and any VO2 intake would be a good start. Once you've flashed that map over to the ECU, it's time to set up the FP3 auto tune function. Then, burn at least a tank of fuel through the engine riding in all the places you'd expect to go. Once you've put a few miles on the bike in that manner, open the FP3 app and upload the recommended settings to your bike's ECU. With that, you'll be all set. I have a 2014 HD FLHTP and it doesn't show up on the drop down. Which should I buy for my bike? If you select a 2014 Harley Davidson FLHTCU Ultra Classic Electra Glide it would also work for the 2014 FLHTP. All 2014-2018 HD models us the same tuner, the maps are model specific from the download you select from the FP3 app during installation. You could run that map, it may be a little richer than needed due to your factory air filter. If you installed something on the lines of a K&N filter or a stage one filter from Harley it would run better on that map. I would suggest setting the unit in autotune and leaving it installed an taking it for a ride to see how it responds. It should be able to monitor your O2 signal and adjust accordingly. Can this work with a 2006 dyna super glide? I like the idea of being able to connect the fuel pack to my phone. I know it says this works with only 2007 and newer dynas but can the old one connect to my phone? Vance and Hines currently does not support any HD models prior to 2007 for the FP3 platform. The fuel injection system and diagnostic port changed for that model year range. If you are still looking for the capability to sync and adjust with your smart phone, the Cobra Fi2000 PowrPro Black fuel controller can do so and is compatible with the 2006 Harley Davidson FXDI Dyna Super Glide. You can find that tuner by searching "Cobra Fi2000 PowrPro Black Fuel Controller" in our store search bar. Can this tuner be used with screaming eagle pipes? The FP3 works with all exhaust types. As long as you have other modifications to the bike such as an intake or headers this would be the way to go. For just SE slip-ons it would not be necessary. You would have no problem running an FP3 with a turn signal module installed on the bike. As long as you have access to the diagnostic connector on the motorcycle, you would have no problem downloading a map to your ride. do you leave it on the bike or take it off once you set it up? The FP3 can be left installed on the motorcycle if you are leaving it in an auto tune mode. If you download a product specific map to the bike it can be removed. Once it is activated it is married to that motorcycle for life. It cannot be transferred to another bike or model. Its married to the VIN number.